Jamaica Basking In Afterglow of President Barack Obama Visit - Caribbean & Co.
Jamaica is currently basking in the afterglow of the recent visit by the United States President, Barack Obama. Rightfully so, as these presidential trips are like gold dust and rarely come around for countries in the Caribbean. In fact, the last sitting United States President to visit Jamaica was Ronald Reagan, April 7th – 8th, 1982 – so 33 years ago! During that official visit, the 5th presidential trip for Ronald Reagan, he met with then Jamaican Prime Minister Edward Seaga. He would go on from Jamaica to Barbados for a 3 day visit to meet with the Prime Ministers of Barbados, Dominica, Antigua and Barbuda, St. Christopher and Nevis, and St. Vincent and the Grenadines. So how will Jamaica capitalize on this short visit by President Obama that had not just Jamaicans, but also most Caribbean nationals across the globe beaming from ear to ear? Well, a bilateral agreement was signed to “boost the development of emerging technologies and industries, and pave the way for future innovation in energy-related fields.” What else beyond this politically? Well, that is yet to be determined as the actual time spent with Jamaican Prime Minister Portia Simpson Miller and the other Caribbean Community and Common Market (CARICOM) leaders was somewhat limited. 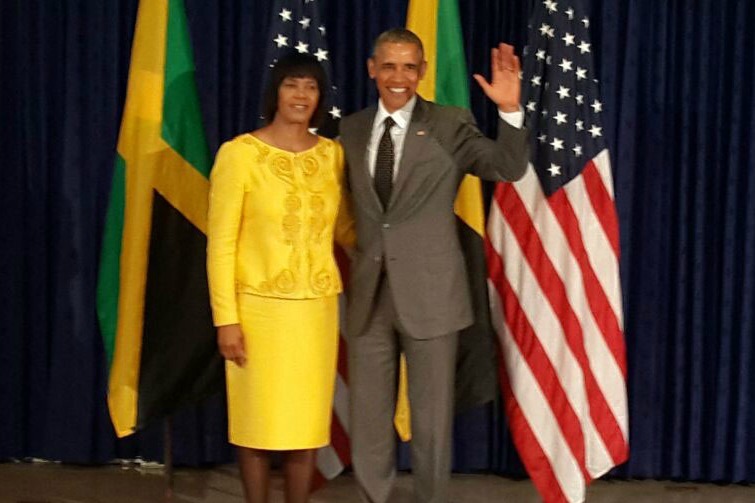 President Obama with Jamaican Prime Minister Portia Simpson Miller. Photo: ©Jamaica Information Services. Interestingly, the White House is reported to have characterized the visit as little more than a goodwill excursion in which the president played tourist. Whatever the case, it is likely that almost all Jamaicans involved in this the 40th international trip by President Obama will treasure the memories for the rest of their lives. President Obama sings along to Bob Marley music being piped in as he tours the Bob Marley Museum with tour guide Natasha Clark. Photo: ©Pete Souza/White House. 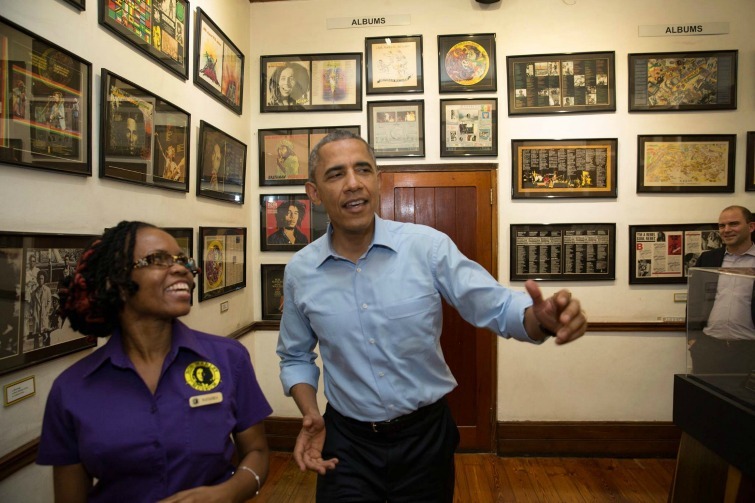 Beyond lasting memories, the visit by President Obama is also sure to help boost interest in the Bob Marley Museum and Jamaica itself, which welcomed just over 2million tourists last year. * December 5, 1940: President Franklin D. Roosevelt – Inspected British base sites for possible American use. * April 7-8, 1982: President Ronald Reagan – Official visit; met with Prime Minister Seaga. * April 9 – 10, 2015: President Barack Obama – Met with Prime Minister Portia Simpson-Miller. Delivered a speech at the University of the West Indies. Laid wreath at the National Heroes Park War Memorial. 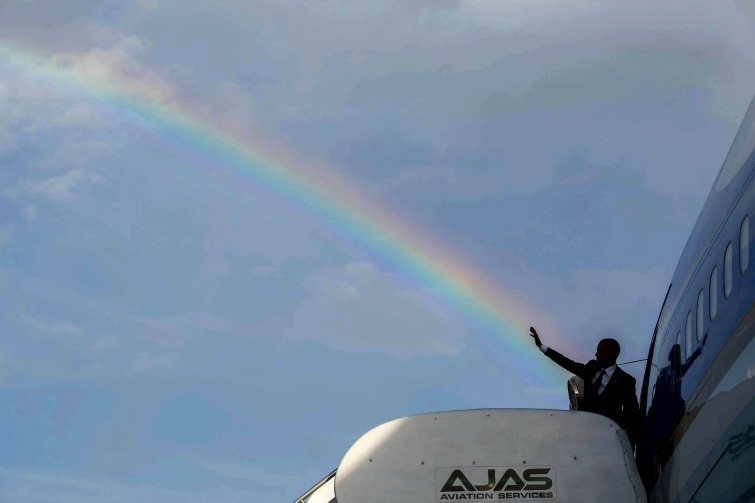 President Obama waiving goodbye to Jamaica. Photo: © Pete Souza/White House.